If Superior Spider-Man #23 was a case study of what often frustrates me about reading a Dan Slott comic, than Superior Spider-Man #24 is a prime example of what I love about his work. Like its preceding issues, Superior #24 moves at breakneck speed, with a countless number of plotlines getting introduced and tabled on nearly every page. But whereas I found Superior #23 to be busy to the point of distraction, Superior #24 grips me with every twist and turn, never losing its focus along the way. 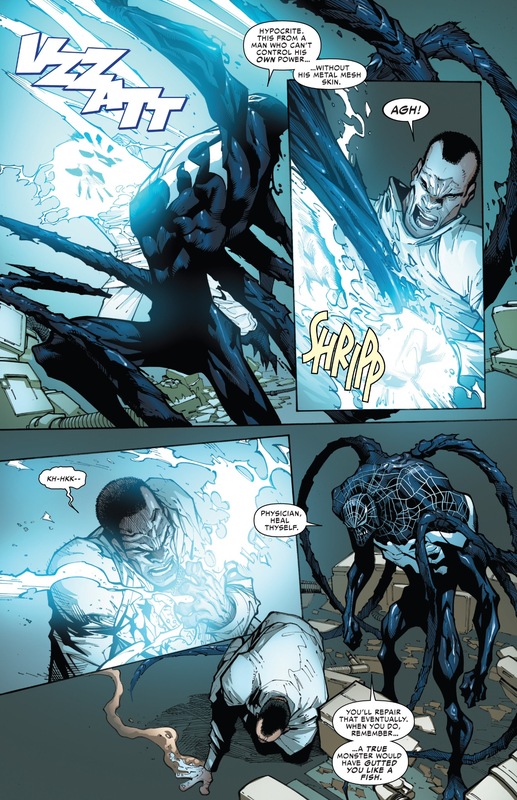 Trouble was clearly on the horizon when Spider Ock bonded with the symbiote last issue, but even I am shocked by just how quickly things unravel for Otto. Feeding off the power of the symbiote, the “Superior Venom” leaves Flash and Cardiac wounded and weary (and Flash apparently only has “hours” to live … better not tell Star Lord and Rocket Raccoon the bad news), exposes his inner evil to Aunt May, and frightens Mary Jane to the point that the Avengers have FINALLY been called in on the case (which is only something I’ve been screaming about for months now… maybe not the right reason somebody called, but at least somebody called them). Slott and Christos Gage flawlessly transition from sequence to sequence, while Humberto Ramos gets the kind of world coming apart story he excels at artistically. Again, the book moves fast, but each scene gets just enough time for the pacing to feel organic. There were far too many instances in the last issue where it felt like Slott and Gage checked in on certain characters more out of obligation than necessity. I understand that the bulk of these threads will likely all tie together come “Goblin Nation” over the next few months (like Jonah and the Spider Slayers or Parker Industries), and thus need to get introduced now or never, but the rushed nature of these transitions makes these events feel less consequential. Every panel has a purpose in Superior #24, giving me the impression that it’s all leading somewhere big in two weeks. While I’ve said in the past that this series is at its best when Spider Ock seeks redemption, I appreciate how Slott and Gage take no half measures when it comes to their characterization of Superior Venom. 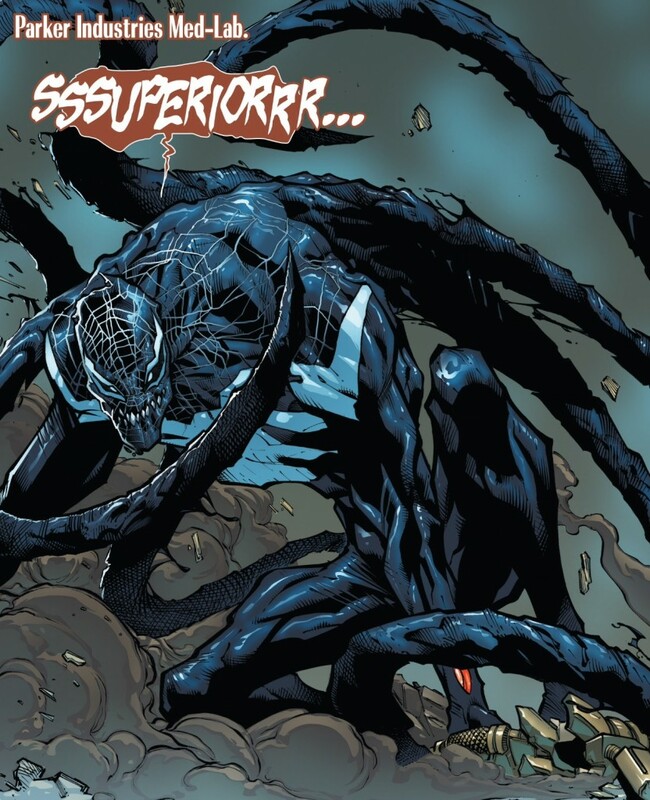 The symbiote should and does expose all of Otto’s worst, most villainous traits. There is never even a hint from the script that perhaps Otto will find a way to control the symbiote and still continue his charade as Spider-Man. While I’m not willing to bank that Otto becomes officially exposed in the very next issue, the jig is almost certainly up. Yes, I was right in that certain undesirable character moments took place in prior issues because Slott and Gage needed things to play out a specific way down the road. 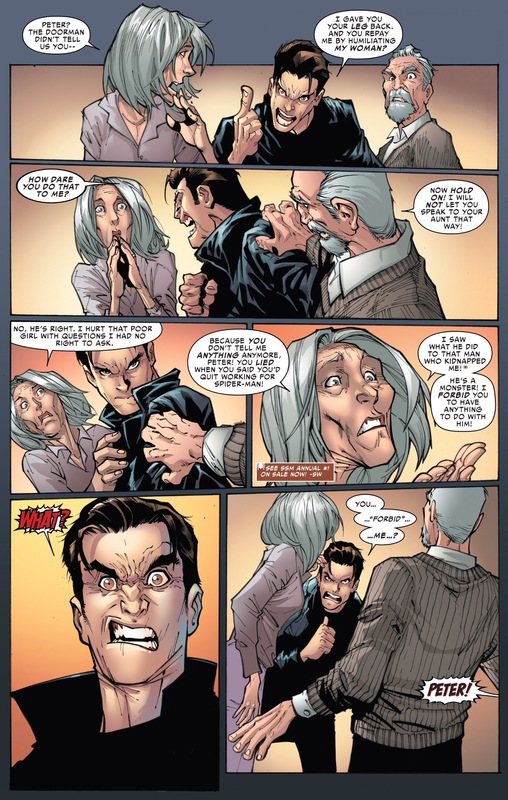 Most notably, last issue’s awful brunch scene involving Aunt May and the borderline intolerable things she said to Anna Maria about her “little person” DNA. But at least Slott and Gage work to redeem May a bit in this issue, having her admit to “Peter” she was wrong to speak to Anna Maria like that, but also having her explain that her anger is misplaced, and that she’s really upset about how “Peter” continues to lie to her about his comings and goings – especially his relationship with Spider-Man (and hey, that Annual that “counts” gets referenced). 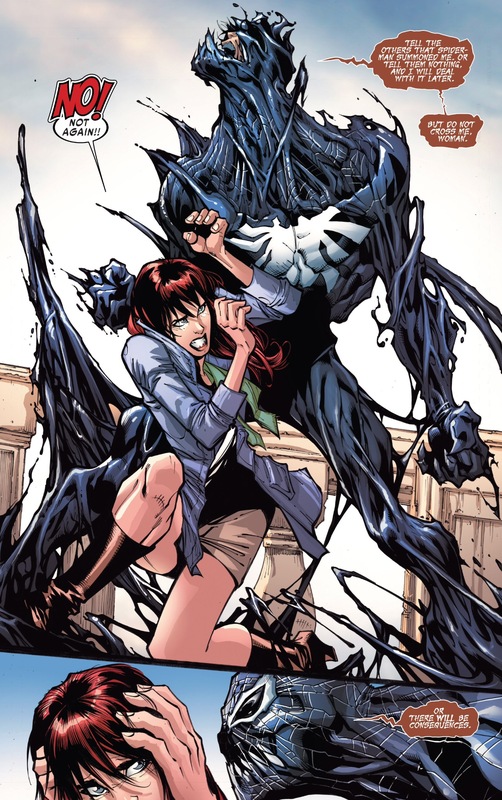 Plus, if you combine the established friction between “Peter” and May, and then his emotional instability from the symbiote, you’re left with a compelling scene that had me guessing how Otto was going to react. For the first time in perhaps the entire Superior era, the Green Goblin feels like he has something to do besides show up for one page, laugh maniacally, and then disappear again. This Green Goblin clearly has his sights set on getting rid of Roderick Kingsley, aka, the original Hobgoblin, once again putting another check under Norman Osborn’s name on the “who is the Green Goblin” scorecard. Watching the Goblin bilk some of the Hobgoblin’s “franchise” villains – including somebody in a bear suit who swears he’s not The Grizzly, but rather the Bruin – is a funny scene capped by the Goblin throwing away the money (“it was cumbersome” – great line from Gage). The issue also shows the Goblin at his most diabolical, spraying his hostage Carlie Cooper with goblin serum in an attempt to make her “family” so she can share any “secrets” that she knows about Spider-Man’s identity. On both Chasing Amazing and Twitter, I’ve talked to fans who have this theory that the Green Goblin is actually Peter Parker in control of Norman Osborn’s body. I find this idea to be implausible for many reasons, but primarily because having Peter be impersonating his most nefarious adversary (and acting like a villain in the process – remember when the Goblin’s goons firebombed Mary Jane’s nightclub?) would be the most out of character editorial decision since a certain deal with the devil was made a few years ago. But the comeback to my cynicism has been nobody sees this Goblin do bad things, just his surrogates … well if you think spraying an innocent woman with goblin serum isn’t a bad thing, then I don’t know what to tell you. Perhaps the Goblin isn’t an Osborn, but I can say with near-certainty, he’s not Peter, and if he is, I will feel very, very betrayed by this story. And on a final note, three cheers for Mary Jane Watson for finally showing up in this series. This character has been terribly under-written since the end of Spider Island after Slott teased that perhaps she still “loved” Peter. But he only brought the two of them closer after Doc Ock had taken control of Peter’s body and proceeded to talk to her like a dog. I love how assertive and confident she is in this issue, demanding that “Peter” talk to her about whatever it is that’s bringing about this wicked change in personality. We then get a wonderful spread from Ramos, referencing one of my favorite Todd McFarlane splash pages from one of my favorite Amazing Spider-Man issues of all-time. Superior #24 isn’t the thought-provoking back and forth that Superior #9 was, nor does it have the gleeful, schadenfreude-fueled developments of Superior #19, but the comic still stands as one of the better Spider-Man comics of 2013. After letting me down a bit two weeks ago, Slott (and Gage) prove once again, that you can never count this series out for more than an issue or two at a time. Being one of the early advocates of the “The Green Goblin is somehow Peter Parker” theory, perhaps I can explain the rationale behind it. First of all, its evident that, when reading Superior Spider-Man and the Green Goblin subplot that the causal reader is supposed to jump to the conclusion that the Green Goblin is Norman Osborn. However, Slott himself has pointed out that we have yet to see what the Green Goblin looks like without his mask. Also, in Superior Spider-Man #16, notice that when Phil Urich asks if he’s being taken to see Norman Osborn, Menace doesn’t confirm or deny this? Also, if the Green Goblin is still Norman, then why did issue #15 go through all the trouble of hiding his face? All this suggests that Norman Osborn still being the Green Goblin is a red herring and that it’s someone else under the mask. However, given the amount of built-up towards “Goblin Nation,” the Green Goblin being revealed to be Harry Osborn, Gabriel Stacy, Vin Gonzales, or Bart Hamilton (someone I briefly entertained as a possibility) would come off as a wet blanket. Harry, in particular, wouldn’t make sense given how Slott himself has established that his number priority is raising his new son, Stanley, and that he wants nothing whatsoever to do with his father or Spider-Man, and that he’s in hiding from the Goblin cult. 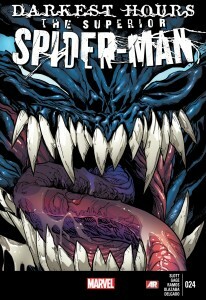 So the identity of the Green Goblin, especially going into Goblin Nation—which Superior Spider-Man itself has been building towards all this time—needs to make readers jaw drop, ask all sorts of questions, and throw a conniption fit like they did for Amazing Spider-Man #698, #700, and Superior Spider-Man #9. And unfortunately, the only person who would fit the bill is Peter Parker. Especially if the Green Goblin removed his mask and we saw the face of Peter Parker underneath. And there’s some potential anecdotal evidence that the Green Goblin could very be somehow Peter Parker. Prior to Doc Ock switching minds with Peter, we saw two instances in which Spidey used Goblin-style equipment and tech to battle bad guys—the first being the first part of Ends of the Earth, and the second in ASM #697. Couple this with Peter having had the Goblin Key which gives him access to all of Norman’s secret lairs, it’s possible that Slott was using a bit of foreshadowing in those moments. We know that the Green Goblin has the technical know-how to reprogram the spider-bots to make them “blind” to anyone being a Goblin. It’s also more than coincidental that, of all the spider-bots he wanted to be tested in issue #10, he orders the Goblin-kids to check out the one right outside MJ’s nightclub. Also, the way he attacked Phil in issue #17 with a kick and his stance looks eerily similar to martial arts, and there’s a preview scan of issue #26 Slott posted on his twitter in which the Green Goblin appears to be using a kung-fu style palm strike—and we know Peter, when he temporarily lost his spider-sense, took up martial arts training. As for the Green Goblin saying he doesn’t know what Spider-Man looks like under his mask but feels he should know it, while this can apply to Norman, who else should know Spider-Man’s true identity than Peter himself? This would also mean that if the Green Goblin is somehow Peter, then it also means he’s somehow lost his memory of ever being Spider-Man—which is how the apparently revived Ghost Peter, which is apparently Peter’s memories having gained self-awareness, could come into play. Of course, the question is how Peter became the Green Goblin in the first place, if indeed the theory is true. These are some well explained ideas, but my brain keeps coming back to this idea that even if this idea were to be true … wouldn’t this feel like a major betrayal from Slott? Sure, let’s make our jaws drops like he did in ASM #700 and Superior #9 and have us carry pitchforks around, but there’s a major difference between killing off the hero of a comic book series and literally turning him into a villain. The Green Goblin either himself or through his surrogates has done awful things in this series. He nearly killed MJ, and he lord knows what’s being done to get Carlie to talk besides threatening her with Goblin serum. And if the explanation ends up being “well he didn’t remember being Spider-Man” then I’m going to view that as a major cop-out and when Peter eventually does return, it’s going to make me feel very, very conflicted about even wanting to read about him. Despite all of Slott’s “Peter is dead” bluster, I’ve always viewed Superior as being a referendum and what it means to be Spider-Man, and I do subscribe to the idea that Slott actually is a huge Spider-Man fan and loves the character, but also desperately wanted to tell a new story using the character. So we get this 30-whatever issue treatment on someone being “Superior” – and for a while, he IS superior. But at the end of the day, Otto will realize that’s he not superior, and there’s only one true Spider-Man out there… if that’s not the tone this series ends on, I’m going to be shocked and it means I’ve basically misread every single beat for the past year. Not saying it isn’t possible, but I just don’t know how we arrive at that point if Peter somehow found himself in the Green Goblin’s body as his way to return. As for who is actually the Goblin, there’s that old scene in a Ditko/Lee issue where Spidey jokes that sometimes the it IS the butler, and this desire for a huge reveal is unrealistic. Given Slott’s mastery of Spider-Man history, I would bank on it either being someone less outlandish, a la Norman, or someone we’re just not thinking of but who is also obvious. Thanks, Mark. You have a point that, if the Green Goblin is indeed Peter in Norman’s body or what have you, it would seem like a betrayal of Peter as a character, but I think it could potentially tie into another theme that Superior Spider-Man has explored–the fine line between hero and villain. After all, Doc Ock, even though he’s proving to be a more effective “Spider-Man” is still very much the arrogant megalomaniac and sociopath he always was; Peter being the Green Goblin would potentially fall along similar lines, especially if it also suggests that, if Peter was never Spider-Man and didn’t learn the lessons that came with it, this is the man he most likely would’ve become. Not to mention that, when Peter is restored back into his body and his mind intact, his experiences being the Green Goblin and what he did while being the Goblin serves to add to his characteristic sense of guilt as well as seeing what Doc Ock wrought. You also make a good point about the Lee/Ditko reference. One thing that could play with that idea is there’s a theory over at Spider-Man Crawlspace that Liz Allan’s secretary, Mason Banks, is actually the Green Goblin (whoever he may be) in disguise, based upon how the out-of-costumed Green Goblin in issue #15 wore the same exact business suit as Banks did. And how SpOck’s spider-sense in issue #17 went crazy anytime Liz, Tiberius Stone, Normie, and Banks were in the same scene. Actually his spider-sense clearly reacted to Normie, who flat out said in response to something like “spider-man is a friend”, “no your a bad man.” I think he is foreshadowing that Normie has some means of recognizing the change in peter. I got a very “psychic kid” vibe from Normie there. No, fellas, I don’t even let up on Christmas. Having finally read this issue, as well as the previous two, and listened to the latest Spider-Talk, I have to say that again, while I totally dig yours and Dan’s theory about how Peter regains his body, I do feel you’re both willfully ignoring the fact that something funny is going on with the Goblin. You really don’t find it at all suspicious that the Goblin threw the money away? Or that there’s no scene where he throws the money away? Or that he claims to want to send a message, but he didn’t just burn the money in front of the Bruin when he had the chance? Or that Carlie Cooper doesn’t have a bruise or scratch on her body after implied torture? None of this makes sense unless you believe that Slott, Gage, and Ramos really have no idea how to tell a visual story. Time and again, we’ve had scenes where the Goblin says he’s taking some action, and then that action is never shown (even the serum, yep, he sure did splash some green liquid on her face with unseen effects). I’m pretty sure Dan Slott’s been in the game long enough to have heard “show don’t tell,” and I’m not saying the conclusion is “Ok definitely Peter,” but you have to acknowledge that something strange is going on. At the very least, this is deliberate misdirection on the part of Slott to throw close readers off the clear trail to Norman. In other words, the idea that revealing Peter Parker’s face under the Green Goblin’s mask is some massive betrayal of the character just doesn’t wash, because the way these things work is that you go for maximum shock value on the cliff-hanger unmasking, and then in the next issue the convoluted plot mechanics reveal that nothing is what it seems. In a not-in-their-right-mind superhero story, of which there have been many (one famous one involving Spider-Man and Doctor Octopus comes to mind – the Ultimate Nullifier), the Hero’s character has always remained intact as long as they didn’t do anything irrevocable. As far as I’m concerned, this new Goblin is so-far-so-good on that count (although I understand Mark’s serious issues with the goons attacking MJ’s). Despite the above, I’m not trying the ram the Peter theory down your throats. I’m not committed to it myself. It would be very hard to explain, and thematically your theory is better. However, I must insist that something genuinely shocking is in the wings with the Goblin. I suspect it will be connected to Otto’s missing corpse, which was introduced and then VERY quickly forgotten. If we were insulting, even unintentionally, I apologize. We agree with you on the notion that all is probably not how it appears but we wanted to clear the air on our feelings about the idea of it being Peter under the mask. I think moving forward it will probably be best to just wait and see who it is under the mask and discuss what that means rather than speculating. Getting into an argument about something we don’t know really doesn’t do much good. The fun is speculating and everyone is entitled to their own feelings. We just really wanted to clear the air about why we don’t buy into the Peter as Goblin theory with what we believe is supporting evidence about why. We are obviously approaching how this comic is meant to be read from different perspectives. I read Dan Slott’s Spider-Man as a very matter-of-fact book that doesn’t operate in incredible subtly in its characterization. I believe how Slott utilizes character’s voices and bold dialogue is one of his hallmarks and defining traits. So when someone says something, I take in on face value. When Carlie has green liquid thrown on her and the solicits advertise a new goblin… well that just makes sense. Dan Slott has been in the game quite awhile and is very aware of “Show don’t tell” and yet continues to tell instead of show. He’s a guy who loves quick plots and comics with a lot of story in them with little time to elaborate. His style is influenced by early Marvel writers where a device would be introduced in one panel and then putting into practice in the next and the audience would just have to keep up with it. I’m excited to see where this is all headed and when it does come to pass in the next month or two we can all sit down and compare notes. As we said at the end of the show, whether you agree with us or disagree with us we love the feedback and encourage you to keep sending it in. It allows us to reassess our opinions to either strengthen them or throw them aside. 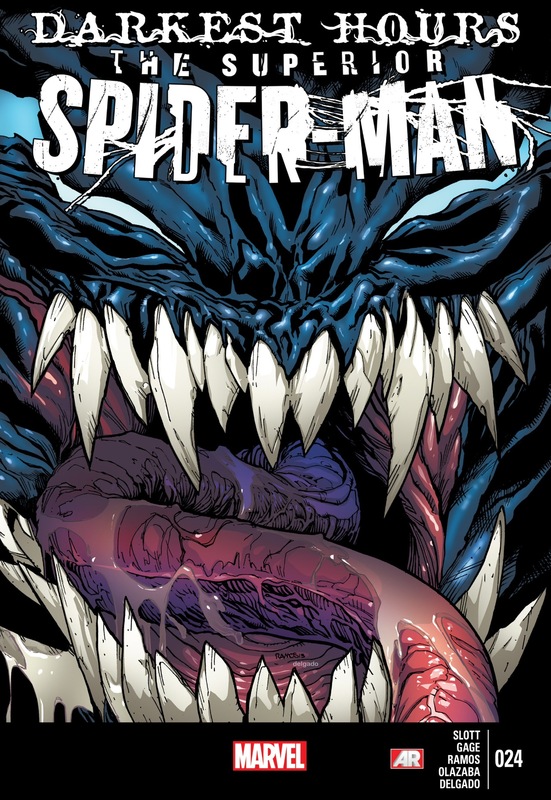 Superior Spider-Talk is where we go to express our opinions on books and, heck, to respond to opinions that we see. I hope we didn’t overstep our bounds. It seems minor but honestly this is what sold me that there is no way that the person under mask is not an Osborn. Dan Slott is just being coy by hiding his face. There are two people who hate Kingsley personally a lot: Norman Osborn and Betty Brant and cannot be Brant. The fact that Green Goblin goes to the trouble to just teach him a lesson/punish him, not because he is a criminal, but because he is an outcast Goblin, says a lot. I am betting Norman is still mad at Kingsley getting those goblin notes. He also called Kingsley as black sheep of Goblin family. It could also be Harry wanting to prove his father but what a character derailment after the development he got. 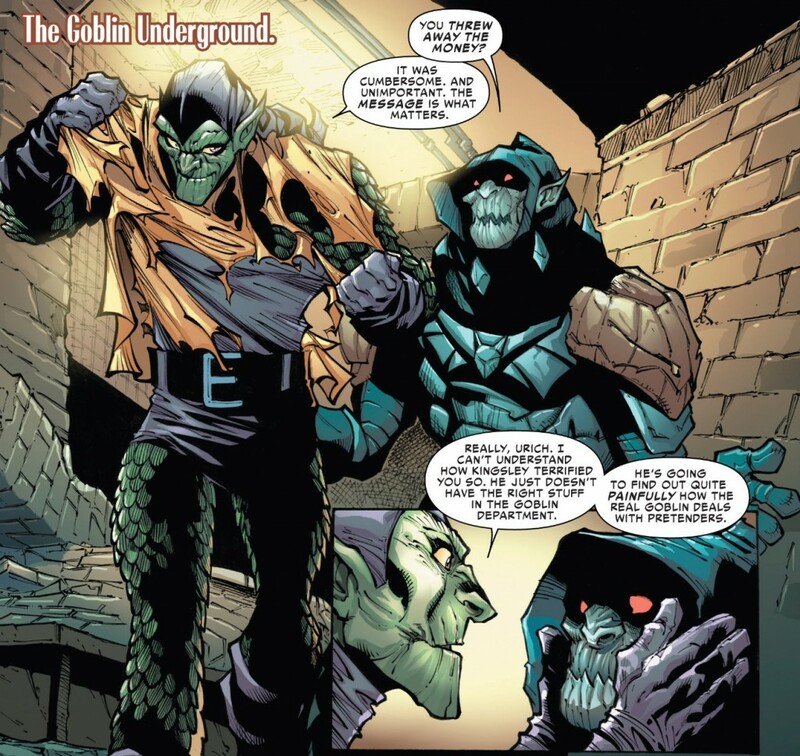 My best theory is that there are 2 Green Goblins with one being Norman and the other being a brainwashed Harry, Gabriel Stacey, Vin Gonzales and another Goblin clone that Osborn could have created. I wouldn’t be surprised if Slott throws this curveball by revealing that Norman had someone stand in for him part of the time when the mask comes off.